Surging mudslides and floodwaters in and around Sierra Leone’s capital Freetown have killed more than 300 people, many of them trapped as they slept. Another 600 people are missing, the Red Cross said on Tuesday, with the death toll expected to rise. Thousands lost their homes in the disaster, which was triggered by heavy rains. Fatmata Kamara had just stepped outside her house before dawn on Monday when she saw the muddy hillside collapsing above her. “I ran away from the house, leaving behind my family,” she said. “I am the only one that has survived, as my house and dozens of others were covered with mud and boulders.” Rescuers dug with their bare hands through the thick, reddish mud to try to find any survivors in the debris of the homes. Heavy equipment was later brought in, said government spokesman Cornelius Deveaux. The military also was deployed to help. Deveaux said 297 bodies have been recovered so far, including 109 males, 83 females and 105 children. Some bodies were swept into the sea off the coast of the West African nation and have begun washing back ashore. The mortuary of the Connaught Hospital in central Freetown was overwhelmed with the dead. More than 300 bodies of men, women and children were brought there, and many were laid out on the floor. Deveaux said an exact death toll was unknown, and many of the bodies were horribly mangled. 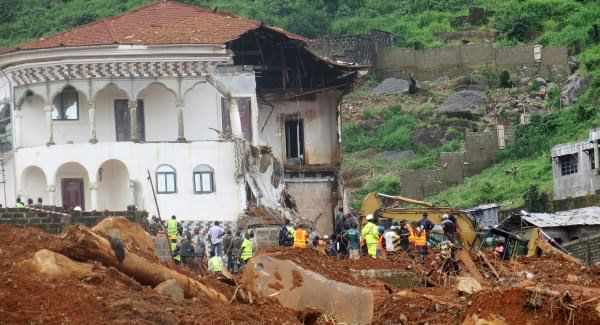 President Ernest Bai Koroma said Sierra Leone was in a state of grief and mourning, with many survivors still in shock. He called for seven days of mourning starting on Wednesday. Radio journalist Gibril Sesay said he lost his entire family. “I am yet to grasp that I survived, and my family is gone,” he said. An estimated 9,000 people have been affected in some way by the disaster, said Abdul Nasir, program coordinator for the International Federation of Red Cross and Red Crescent Societies. Charles Mambu, a civil society activist and resident of one affected area, Mount Sugar Loaf, said the magnitude of the destruction indicated that hundreds more people could be dead. Two people were pulled alive from the debris Monday evening, Mr Mambu said. The UN said it is providing emergency response assistance. Contingency plans are being put in place to try to stem the outbreak of diseases such as cholera, Deveaux told radio station FM 98.1. The bodies that have been recovered will begin to be buried in the next 48 hours, said Sulaiman Parker, environmental protection officer for the Freetown City Council. Many of the poor areas of Freetown are near sea level and have poor drainage systems, which makes flooding worse during the rainy season. The capital also is plagued by unregulated construction of large residential houses in hilltop areas. Thousands of makeshift settlements in and around the city were severely affected.